This chapter discusses the different costs that XpertMart™ uses, the Order Cost and the Inventory Cost, and the Cost Audit Log where all cost information for an item is stored. Subsequent chapters discuss how to change the cost of an item using a Cost Adjustment or how to make massive changes to the costs of multiple items. There are also special considerations to keep mind when you are setting up your inventory for the first time to keep your accounting of costs straight.. The Order Cost of an Item is the cost at which you expect to receive that Item from your Vendor. The Order Cost functions as a reference as it is the cost that XpertMart™ automatically enters into any Purchase Order or Receipt. You are free to change this price at the moment you are making the Purchase Order or Receipt, but if you choose not to then your Order Cost will, in fact, be the Inventory Cost used. The Order Cost appears in the Items Catalog and can either be entered directly into the Order Cost field of the Items Catalog or is automatically filled in from the Styles Catalog when you check the "Price/Cost from Style" checkbox. Unlike prices where there can be multiple price lists, the Order Cost is the same for all stores throughout the company. Every time you receive merchandise XpertMart™ automatically records the cost that was used in the Receipt into the Cost Audit Log. For every Item, XpertMart™ keeps a running average of the costs from every Receipt. This average is the Invenventory Cost. When you are using XpertMart™ correctly, the Inventory Cost is the most realistic indicator of what your merchandise is costing you. 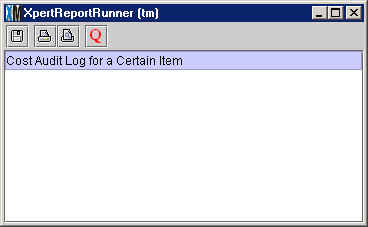 You can always see how XpertMart™ is calculating the Inventory Cost by opening the Cost Audit Log. The Inventory Cost appears in the Inventory Cost field of the Items Catalog just below the Order Cost. The value in this field cannot be edited as it is written-in automatically and the average is updated every time you make a new Receipt for that item. The Inventory Cost is the same for all stores in the chain. Whenever you make an Invoice, XpertMart™ takes the prevailing Inventory Cost at that moment for every Item and records it (though you cannot see this on screen). This is the cost used to calculate your margin. You cannot directly edit the Inventory Cost of an Item. Keeping with our Philosophy of Control, any change to the cost of an item must be done through a document that creates an audit trail. There are only two documents that can change the Inventory Cost of an Item: a Receipt or a Cost Adjustment. When you employ the Mass Changes to Prices and Costs tool what you are in fact doing is creating a batch of Cost Adjustments. XpertMart™ stores every instance of an item being received, and the cost it was received at, in the Cost Audit Catalog, also called the Cost Audit Log. You can view the contents of this catalog by going to the Catalogs>Inventory menu and selecting Cost Audit, as shown below. New Cost: the new average once the Received Cost has been factored in. This is the prevailing Inventory Cost until a new Receipt or Cost Adjustment is made for this Item. The report displays the same information that the Cost Audit Catalog does but allows you to see multiple entries at once and therefore see how the average changes with every transaction. In the example above, the Order Cost for the Black Size 5.0 Zodiacs platform mule is $17.50. However, the first time a Receipt was made, on February 6th, the Net Cost on the Receipt was $18.00. Therefore, the new Inventory Cost was $18.00. The second time this item was received the Net Cost on the Receipt was $16.99. When you average 14 pairs at $16.99 with the 6 pairs at $18.00, you get a new Inventory Cost of $17.29. The third time the item was received the Net Cost on the Receipt was $17.50, yielding a new Inventory Cost of $17.33. This means that each one of the 25 pairs of Black Size 5.0 Zodiacs you have received so far is costing you $17.33 on average. NOTE: The "Initial" quantity of an entry in the log does not necessarily need to be equal to the "New" quantity of the prior entry. If in the intervening time pieces of merchandise were sold, the "Initial" quantity of the new entry will of course be lower than the "New" quantity of the prior entry.